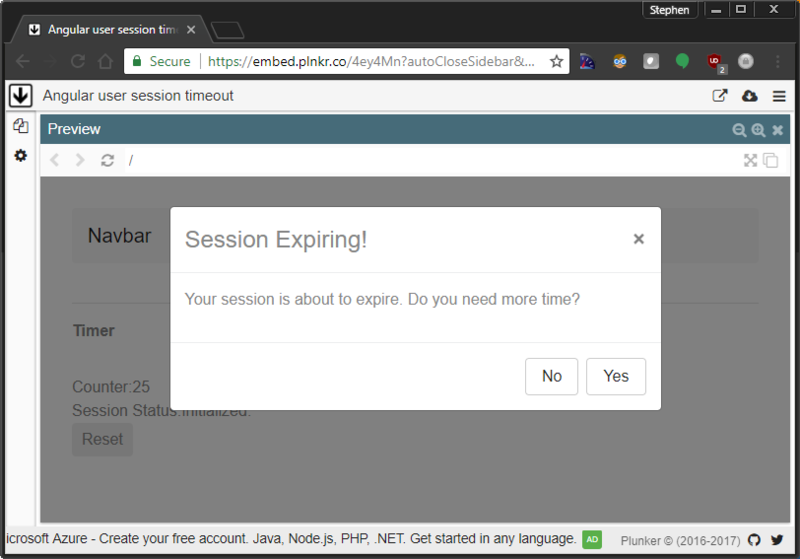 A long time ago, I blogged about a service that I used in AngularJS to let the user know that their session is about to expire and that they would be logged out if they didn’t take action. I needed to recreate this functionality in Angular for my latest swath of applications. Dealing with timers in Angular can be significantly different when using React components and subscriptions. The basic premises remains the same, though. We’ll have a service with a timer that will provide a Subject to which consumers of the service can subscribe. A React Subject provides an easy mechanism to trigger a “next” subscription to alert consumers that the timer has expired. The new service, which I am simply calling IdleTimeoutService, will provide the same methods as the old AngularJS service: startTimer, resetTimer, etc. The timer variable is our actual Observable that we use internally. You can see below that we use React’s timer observable. We’ll have it trigger in five seconds and subscribe to it. Once it is triggered, we call our handler. The “startTimer” method sets up our subscriptions. Our timer handler will call the “next” method on our Subject to which others may be subscribed. This provides a nice eventing mechanism. Optionally, we can reset the timer after trigger. However, for most of my use cases, I’ll be resetting this manually. To consume the service, the IdleTimerService is injected as needed. Then, we can subscribe to its exposed/public Subject. The basic subscription is show in the code snippet. While I didn’t illustrate it, this becomes the starting point for hooking into Http interceptors to access a heartbeat API, or some other endpoint, to extend the user’s session at the server level (or cookie refresh). All in all, timers and observables are pretty fun to play around with in Angular. Thanks for the great article. I have a question about the following scenario: Say a user is using a laptop. He’s browsing the website and he session is alive on the FE. Then he closes his lid (counter also stops) and opens it up. On the BE his sessions is dead, but on the FE the counter starts from where it left off (so session is alive). How would you advise to solve this? That’s an interesting problem. I hadn’t really thought about it before, but I don’t think browsers give any sort of notification of when the system goes to sleep. However, it would be pretty easy to have an interval that is storing the current date and comparing it every five minutes or so. This could be done via setInterval or an RxJS timer in a similar fashion to what is already in the idleTimeoutService. I updated the Plunk that includes this change as well as updated the Plunk to utilize the latest version of Angular/RxJS/etc.